The study of the vibrations in domains with boundaries or interfaces of irregular geometry is a complex mathematical problem, for which many questions are still unsolved. Nevertheless, it has been known for a long time that objects of irregular shape or geometry are “bad resonators”. From the seminal work of Bernard Sapoval, a physicist at the Ecole Polytechnique (France), this idea was applied to acoustic vibrations, and experimentally tested in the lab in the 1980’s. 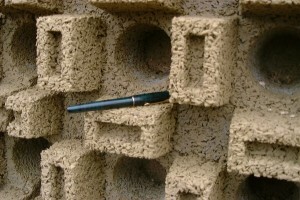 It led to the invention of a revolutionary type of acoustic barrier. 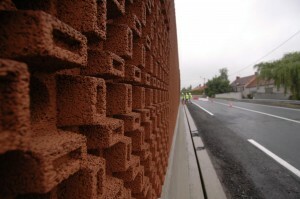 Together with Marcel Filoche, also a physicist at the Ecole Polytechnique, and in collaboration with Colas®, a private company specializing in road construction, a prototype made out of concrete-wood was constructed. The geometry of this barrier was inspired by fractal geometry, since it includes holes at very different scales, ranging from 30cm to submillimeter pores of the material. 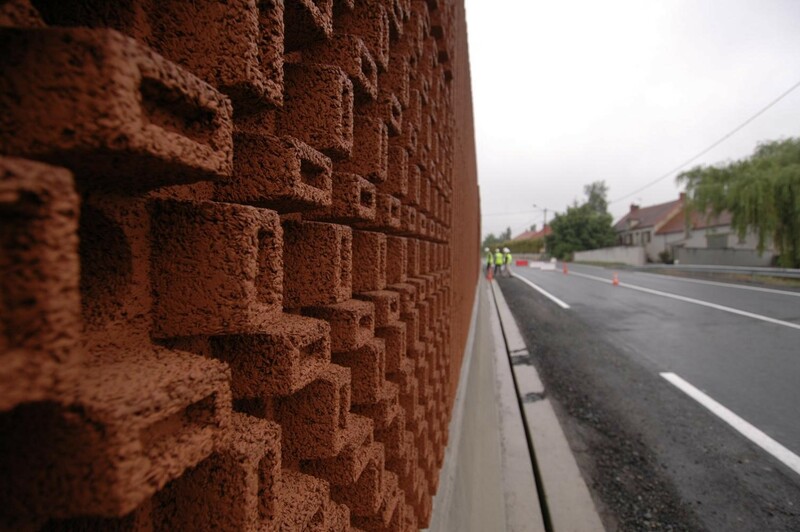 This acoustic barrier, now a commercial product patented under the name Fractal wall®, is characterized by a complicated shape and absorbs on average 98% of the incident acoustic energy in the audio spectrum, for normalized traffic noise. The absorption and acoustic properties of this structure are intimately linked to the spectral properties of the Laplacian operator in complex domains. By allowing a deep and fruitful interaction between mathematicians and physicists, the IPAM programs Random Shapes (co-organized by B. Sapoval), and Laplacian eigenvalues and eigenfunctions: Theory, computation and applications have had a considerable impact on the understanding of such systems. In particular, they helped to put the concept of wave localization, which plays an essential role in their acoustic properties, into a theoretical framework. Doing so, they have contributed to development of new collaborations and to opening of new research directions in this domain.